Our laser technology lumineers placement is considered to be the best bonding technology for lumineers and Hollywood smile design. Our privilege of being the first certified as an official affiliated Lumineers Cerinate clinic in Lebanon is the availability to provide the Lumineers by Cerinate in 6 days and to give you a 5 years international warranty by the Cerinate labs in the USA on all prosthetic treatments signed by Ferrari Dental Clinic Team dentist. The Official Provider Of Lumineers By Cerinate Clinic in Lebanon. The Most Rated dental center for hollywood Lumineers smile tourism in Lebanon (ref: the Arabian Business). Advances in the technology of bonding porcelain to enamel created the possibility of porcelain veneers as an alternative to the use of full crowns for the treatment of many clinical conditions, Veneers were considered to be a more conservative treatment approach. Although this may be technically true, in actuality, the trend in conventional veneer procedures is to use very aggressive tooth reduction similar to that of three quarter crown preparations. Fortunately, a truly conservative approach to veneers with many substantial advantages has been developed: LUMINEERS. This 43 year old patient wanted to give herself a younger, gentler smile. Her smile was changed by making some changes to the shape of her teeth using Lumineers which gave her a more even and regular appearance. Why Select Lumineers by Cerinate for your Smile Makeover? Your smile may look pretty good, but you want even better. You want your favorite celebritiy smile. A LUMINEERS dentist will evaluate your smile and desires and will help you achieve the look you want with no pain, shots, drilling or removal of sensitive tooth structure. Furthermore, it is a tremendous advantage to avoid the great psychological reluctance to having one’s teeth substantially cut down. It is very comforting for the patient to know that their natural teeth remain intact. Although not likely, patients could go back to their original dentition because the no prep technique is reversible. Alternatively, after a tooth is prepared, it is irreversible. After seeing what Lumineers have done for their patients, dentists - such as our colleague in the pictures below- also want to get Lumineers for themselves! In many cases, there is literally no preparation of the teeth, The no prep technique was made possible by advances in custom-designed bonding systems and in porcelain technology that allow exceptionally thin veneers because of new exceptionally high strength porcelain. 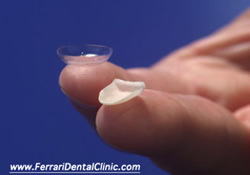 The lumineers can be made with thicknesses in the range of 0.3 mm to 0.5 mm or “contact lens-thin”. The lumineers can be simply bonded to the surfaces of the teeth with an excellent cosmetic result and with no problem of awareness of thickness by the patient. Furthermore, there is no problem with the emergence profile. Finishing and contouring in the gingival region can be easily accomplished when the bonding system is integrated to the porcelain. This greatly simplifies and expedites the clinical procedure for the treating dentist and accomplishes the generally desirable goal of preserving natural tooth structure. From the patients perspective, the absence of “shots and drilling” makes the procedure much more pleasant, and removes a large barrier for individuals with phobias for dental treatment. In conjunction with the procedure, as well as a likely reduction in the possibility of causing pulpal necrosis as a sequel of the procedure. Stained or discolored teeth can be a major embarrassment because no amount of bleaching, brushing or visits to the dentist will remove the stains. Now there’s a hassle-free solution to the problem. LUMINEERS BY CERINATE, which are like thin covers for your teeth, eliminate the traces of any stains or discoloration. Best of all, a LUMINEERS procedure leaves you with permanent whitening. "Without any pain my teeth were straightened, whitened and my smile came to life. I kept waiting for it to hurt, but it never did. I smile all the time now" The patient's statement reveals why she selected Cerinate for her smile makeover. Do you have a chip on one of your teeth, or gaps like right in the front where everyone can see? Bet it bothers you big time. While bonding may offer a temporary fix, it may not be the most reliable way to ensure an attractive smile for the long run. LUMINEERS offers a painless, permanent and pleasant way to fix your chipped tooth for good. You’ll always smile with confidence. This 40 year old patient had always been embarrassed by her smile. That all changed in 2 visits. she had a full mouth lumineers placement. it took less than a week to change her smile! Now that's really something to smile about! A special feature of the no prep technique is the ability to bond lumineers over existing fixed prosthodontics that has become aesthetically unattractive. Frequently, existing crowns and bridges are functionally and biologically sound, but have become cosmetically compromised. It is a great benefit for the patient to be able to have the cosmetic appearance of fixed prosthodontics restored without the need for replacement. Don't even think about replacing your less-than-perfect crowns or bridgework. LUMINEERS them! Not all cosmetic dentists offer Lumineer veneers, as they need to be registered with the company that manufactures them. LUMINEERS can only be made from patented Cerinate porcelain unavailable anywhere other than the Cerinate Smile Design Studio in the States. In just 2-3 visits to your LUMINEERS dentist, you can have a custom-made smile that is clinically proven to last over 20 years - and it is completely reversible since your natural tooth structure is still intact! Get your perfect smile today! An impression is made and the mold is sent to the Cerinate Smile Design Studios where only LUMINEERS are crafted. On next dental visit, the dentist tries in LUMINEERS to ensure a good fit. Teeth are moderately etched to prepare for placement but there is no removal of sensitive tooth structure, unlike the painful part of traditional veneer techniques. The LUMINEERS are bonded to natural teeth and set in place with a curing light. Thanks to no or little preparation of the tooth, there is no risk of pulpal sensitivity in conjunction with the procedure, as well as a likely reduction in the possibility of causing pulpal necrosis as a sequel of the procedure. This 30 year old patient came to our clinic because his central incisors showed signs of wear as a result of his bruxing habit. He was also concerned about teeth discoloration which gave him a less youthful appearance. A beautiful aesthetic smile was achieved by restoring and whitening his teeth the way they were before the wear took place using Lumineers. LUMINEERS 2, the innovative and industry-leading thin veneer, is now 30% stronger than the original LUMINEERS and available in three translucencies: high, medium and low. LUMINEERS 2 veneers are crafted from the next generation of Cerinate porcelain, the only porcelain backed by over 20 years of evidence-based research. LUMINEERS 2 expands the range of treatment options available in your practice, allowing you to treat over 10 different kinds of cases, such as worn dentition, fractures, misalignment and more. Next-generation Cerinate is pressed feldspathic porcelain reinforced with leucite nanocrystals. Due to its superior strength of 216 MPa, LUMINEERS 2 can be made as thin as a contact lens, allowing placement without significant removal of enamel and without removal of dentin. This minimally invasive technique produces greater acceptance among patients and instantly enhances smiles. Next-generation Cerinate is the strongest leucite-reinforced, pressable glass-ceramic on the market today. The reliability of next-generation Cerinate is significantly higher than Empress. New Cerinate porcelain exhibits low wear rates against opposing enamel when compared to conventional porcelain. Next-generation Cerinate is available in top shades, including bleaching shades and three translucencies: high, medium and low. The low-viscosity glass of newly formulated Cerinate allows pressing of restorations as thin as 0.3mm. To look like natural teeth, porcelain restorations must be highly translucent. LUMINEERS 2 is clearly the number 1 choice for achieving a brilliant, white smile while replicating the natural characteristics of enamel. This conventional approach requires local anesthesia, considerable treatment time and all of the rigors of tooth preparation for both the patient and the dentist. Also, in many cases, temporaries need to be fabricated and applied. The result for the conventional approach to porcelain veneers is very little meaningful clinical benefit. Anesthetic shots are given to numb the area and teeth are severely shaved away with a drill to accommodate the veneers. An impression is made and sent to a lab. Veneers are placed, a better, but still flawed smile, as the procedure is not reversible like LUMINEERS because the original teeth have been shaved down. Veneers can cause your patient pain and discomfort immediately after the procedure because the teeth have been shaved down.